World-class research, innovative teaching in a beautiful, inspiring, modern campus environment. The University of Stirling is implementing a rolling programme to upgrade its AV across its estate. 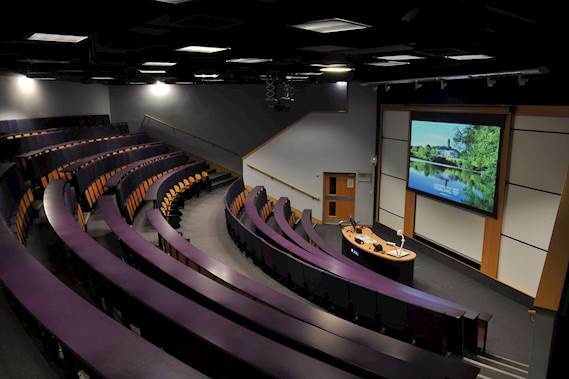 It urgently needed to replace the projectors in two 250-capacity horseshoe shaped lecture theatres in the Cottrell Building. 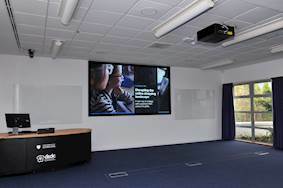 The university also needed a bright projector for its 210-capacity main lecture theatre in the Pathfoot Building to replace its old XGA model, located in a projection booth 19 metres back at the rear of the room. And the facilities team were getting feedback from users that the 4x3 rear projection system in its Iris Murdoch Building Conference Suite was no longer fit for purpose. The bright 16 metre long 120 capacity suite, which is used frequently by external users, has large east facing windows and divides into three separate spaces. When looking at the possible solutions for the two 250-capacity lecture theatres, the team investigated re-utilising concertina lift brackets that had been installed in both spaces before the projection booths at the back of the spaces were used for projection. The lifts were still operational and the Optoma ZH510T laser projectors had the perfect throw ratio to fit onto these existing brackets. The ZH510T is a bright and compact Full HD 5,400-lumen laser projector. With a low operating noise of 28dB, it is the quietest projector in its category. It offers up to 30,000 hours light source lifetime in full brightness mode and an independent dust certification of IP5X. Its lamp-less laser light source provides consistent brightness and colour accuracy. The old 4x3 screens were replaced with 3.5 metre wide 16:9 Da-Lite screens. HDBaseT in the projector simplified the installation as the team needed just one cable for everything. Fred chose the Optoma ZU660e laser projector for the 210-capacity main lecture theatre in the Pathfoot Building. The projection distance is 19 metres and the 16:9 screen is 5.6 metres wide, so the Optoma A13 long throw lens was used. The 8,200-lumen ZU850 WUXGA resolution projector, featuring MultiColor Lasers, offers flexible installation with HDBaseT, four corner geometric adjustment, 360° and portrait orientations and five lens options giving a throw distance from 0.81m to 35.5m. This flexibility guaranteed the projector would fit the projection distance perfectly. Like the ZH510T, the ZU850 needs minimal maintenance as the airtight optical engines has been independently certified as IP6X and engineered for 24/7 continuous operation. The university then installed an HDBaseT scaler switcher, Crestron control system, and height adjustable 75 inch repeater monitors in the other two spaces. These can either mirror whatever is on the main screen or can be used independently if a client wants to use the two other spaces as breakout rooms. 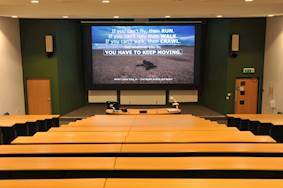 The university will be changing all projectors across its 11 lecture theatres from lamp-based to laser in a rolling programme as the old projectors eventually fail and will be installing Optoma ZU660e and ZH510T projectors.